Hubby and the Little Vegan are out-of-town this weekend so I decided to challenge myself to only prepare food that I could make with ingredients currently in my cupboard or refrigerator. This was the first thing I came up with and it is super tasty! I did cheat a little by buying cilantro. After making the salad I knew I needed it and I couldn’t stop thinking about it! *I like things spicy. I included the amount of cayenne that I used but I recommend that you add a bit at time. For me it ended up with a touch of heat, not over powering but it is very different from palate to palate. *If you don’t have cashew cream or can’t eat cashews use vegan mayo. I think a plain vegan yogurt would also work. *Make sure not to under cook your potatoes! No one wants to bite into an undercooked potato. *This salad was good while it was still warm so serve either way. Put ingredients from potatoes to cilantro in a large bowl. Set aside. Put all dressing ingredients in a blender or food processor and process until creamy. Pour dressing over potatoes and gently mix in. Eat immediately or chill before serving. This looks wonderful! I wonder if I could use soy cooking cream instead of the cashew cream? Cashews are mighty costly here in Italy! This looks really good! I\’m not really familiar with cashew cream, but I make something similar to this with soy yogurt — and cucumbers instead of the chickpeas (also a great idea, thanks!). 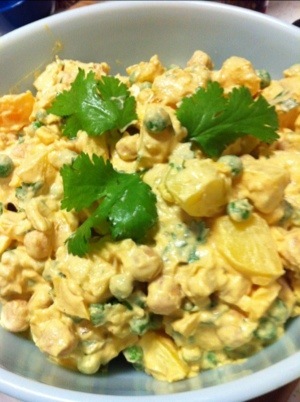 It\’s very much like an Indian raita. I also like the inclusion of the date to offset the lemon and give it a light fruit / sweet balance. Someone else told me they tried it with a mixture of yogurt and veganaise and it was good. Thanks for checking us out!